We at Forum Dental Group believe that children are very precious. Out of a love for children and the desire to see their beautiful smiles, we cherish the opportunity to educate and treat them. Providing children with healthy, aesthetic smiles and attitudes, while helping their parents stay well informed are important concerns to us. This page is intended to offer you an extension of care as you will be able to gather information about dentistry for the children. The first year of Dr. LaMarche’s practice was devoted exclusively to children. Therefore our office environment and practice is designed to make your child’s visit as comfortable and enjoyable as possible. 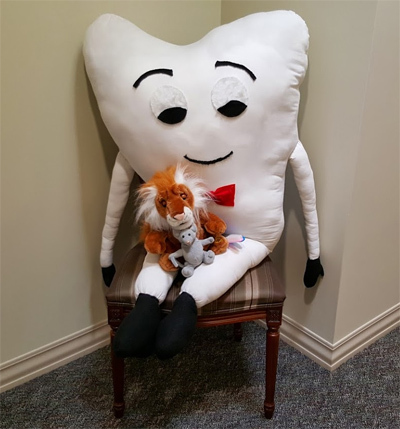 A child with a positive impression of the dental environment is much more likely to seek the care he or she needs to maintain good dental health throughout adulthood. At Forum Dental Group, we are building the foundation for a lifetime of healthy teeth by creating happy experiences. We see a need for providing quality children’s dental care in the Mill Creek community. Forum Dental Group is sensitive to the unique needs of young children and it is our goal to provide that care with the latest proven dental techniques and a warm caring approach. Our highly skilled staff provides the highest possible standard of care. Low-Dose Digital X-rays are much safer for your child than traditional x-rays, emitting up to 30-90% less radiation than these x-rays. There’s no sacrifice in effectiveness, in fact digital x-rays have the advantage of brightness and contrast manipulation, allowing us to see your child’s teeth down to the finest detail. to supplement this diagnostic tool, we utilize Diagnodent laser decay detection. Often times decay on the chewing surface of the molars and premolars is not detectable to the naked-eye or x-ray, but easily measured with this laser diagnostic tool. Pleasant visits with the dentist help a child establish trust and confidence that will last a lifetime. No one should be afraid of his or her dentist. If a child fears their dentist, then they may avoid seeking dental care as an adult. Our mission is to help apprehensive children get over their fears and become happy, willing patients. Also, Dr. LaMarche’s experience of over thirty-years with children enable him to speak with your child with easily understood terms, pictures and ideas, so your child will be motivated to take proper care of his or her mouth. How often should my child come for dental check-ups? To maintain optimal dental health, your child should be seen every six months unless otherwise instructed. Regular check-ups help your child stay cavity-free by emphasizing preventive measure and catching problems while they are still small and cared for easily. Regular cleanings removes plaque that build up on the teeth, cause gum infections and decay. Professional fluoride treatments strengthen the teeth and prevent decay. Oral hygiene instruction reinforces proper brushing and flossing techniques and this leads to a healthier mouth and the prevention of dental decay. Forum Dental Group will also provide an assessment of changes in the oral cavity and may suggest additional fluoride needs, sealants, or changes in dietary content.